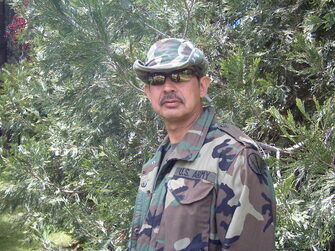 Frank Flores’ military journey began when he enrolled in the Reserved Officers Training Corps (R.O.T.C.) program at James A. Garfield High School in East Los Angeles, California. He then served ten years in the United States Army. He earned his Bachelors of Arts degree from the California State University Stanislaus in Turlock, California. He resides in the Central Valley of California. He is the author of a science fiction work, Skins.